Goldendoodles are hybrid dogs, which are oft-called “designer dogs” in the media. Some Goldendoodles, Golden Retriever Poodle mixes, Goldie Poos, Groodles, or Goldenpoos are a cross between two purebred dogs. Some mislabel a “designer dog” as a “mutt.” But there’s a distinction: “designer” or hybrid dogs have a purebred ancestry that is documented; mutts do not. Hybrids came about in the 20th century when breeders began crossing purebred Poodles with other purebreeds. Monica Dickens first bred the Goldendoodle in 1969. She wanted to develop guide dogs for people with allergies and visual impairment. In this instance, the goal was to blend the Poodle’s non-shedding attributes, and with other positive features like intelligence and agility, along with purebred Golden Retrievers that have a natural disposition to be great family dogs. Thus, the Goldendoodle was born. Popularity spread in America and Australia in part because Goldendoodle’s coats do not shed the way other breeds do. They shed similarly to a Poodle. As a result, Goldendoodles release less dander, a sticky protein made of flakes of dead skin that can cause an allergic reaction. People with oversensitive immune systems may still experience coughing, sneezing, itchy eyes and stuffy noses from the dog’s urine and saliva. To see if you’re allergic to hybrid dogs it’s best to have a blood test for allergen-specific IgE. Dicken’s dogs were dubbed “hypoallergenic.” However, hypoallergenic is a misnomer because people can be allergic to anything. Dogs with a predictable, non-shedding coat can help the people with allergies suffer less. Many dogs’ fur grows to a point and then sheds; Poodle hair, on the other hand, continues to grow and produces low dander. This hair comes in various colors and textures including: white, pale crème, off-white, silver, red, golden, black and may be lightly curled, pin straight, or a blend of the two textures. Still, because of the way it grows, less dander is released. What is it about Goldendoodles that garners so much attention? Goldendoodle puppies have continued to gain popularity since the 1990s. Over the years many public figures showed interest in hybrid dogs including the Goldendoodle. Singer Jessica Simpson had a Maltipoo named Daisy, actors Jake Gyllenhaal, Julianne Moore and Uma Thurman had Puggles and Ashley Judd had a Cockapoo. The 44th president of the United States Barack Obama’s daughter Malia wanted a Goldendoodle, before settling on Bo, a Portuguese Water Dog. President Donald Trump nearly got Patton, a Goldendoodle from his 20-year friend, animal activist and socialite Lois Pope, to keep his 10-year-old son Baron company and to serve as “America’s First Dog.” However, Pope fell in love with Patton and later decided to keep it. Then, there was a Goldendoodle named Dozer who broke free from his invisible fence in the yard and made headlines when he joined in the Maryland Half Marathon at the five-mile mark along with 2,000 other participants. Dozer didn’t have a racing bib, but he crossed the finish line at the 2:12:24 mark and inadvertantly helped raise awareness for the University of Maryland’s Greenebaum Cancer Center. These dogs are remarkable but how are they created? How are Goldendoodles and Hybrid Dogs Crossed? Not all hybrid puppies are 50% purebred with another 50% purebred. This only happens in an F1 generation. F1s (finial 1 hybrids) are created by breeding one pure-bred dog (like a Golden Retriever) with another pure-bred dog (like a Poodle). The puppy becomes a 50-50 mix and is a first-generation hybrid. These hybrids may be healthier then their parents. Some of these puppies will shed; some will not, and this cross may not be ideal for people with allergies. F1 crosses are said to have the most hybrid vigor, heterosis, or outbreeding enhancement which is designed to improve or increase any biological function in the puppies. The hybrid puppies exhibit homogeneity and are often predictable. Plus, these puppies have two different versions of the same alleles. This means there are two different versions of the enzyme present. This lowers the chances for genetic defects in F1 generations. 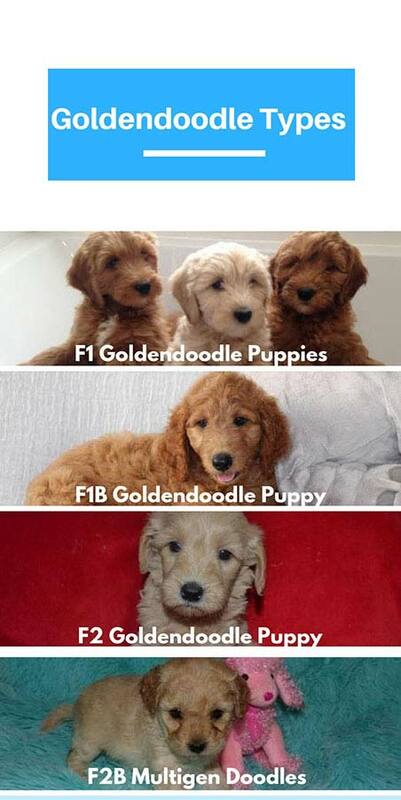 F1B puppies, or backcross puppies, would blend a F1 (Goldendoodle) with another dog (Poodle). The pure-bred ratio would be 25% and 75%. These puppies often have wavy, curly or shaggy hair and are the best bet of Goldendoodle for people with allergies as they rarely shed. F2 puppies are second generation. They are developed from crossing an F1 hybrid with another F1 hybrid. That means one Goldendoodle mated with another Goldendoodle. These dogs will most likely shed. F2B puppies are second-generation backcross dogs that are often called Multigen Doodles. These dogs have less hybrid vigor, heterosis, or outbreeding enhancements but they have an increase of certain traits like non-shedding. This means not all these designer hybrid dogs being bred are 50% purebred to 50% purebred and it is very common for breeders to breed multi-generation crosses. In the end, if you’re looking for a Mini, Large, Standard or Extra Large Goldendoodle you’ll find these dogs long to serve people through attentiveness, obedience, and intelligence. These smart and clever dogs make trusted therapy dogs in hospitals and hospice as well as seeing eye dogs. They’ll make long-lasting bonds with family members and pets. You’ll quickly see why their popularity continues to climb.